Always be sharing -- with status updates that keep patrons informed. 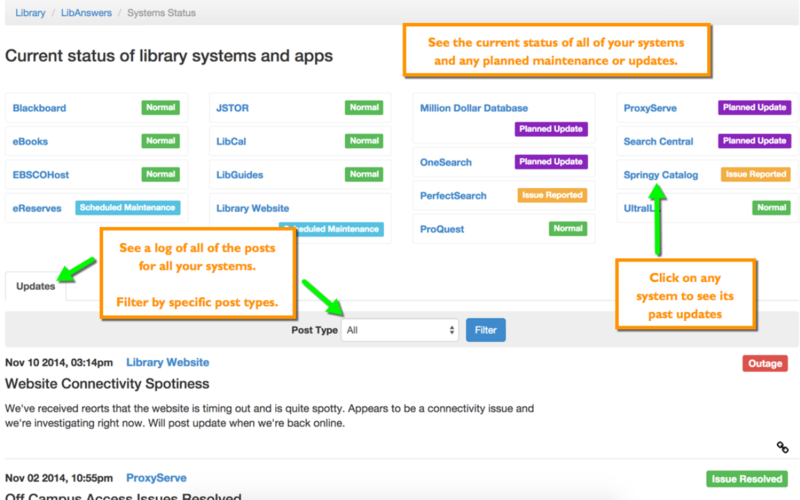 The System Status Management tool helps you keep your patrons informed about the current status of all your systems and services. Plus, Libraries earnestly love feedback so the tool also provides options for encouraging that. Build product-specific widgets and embed them in that product so you can be at the point-of-need. Any product or service within your library can have its own Help Widget. Best of all, the feedback from your patrons will get routed to your LibAnswers Platform queue just like any other ticket! We know how helpful it is to receive questions and comments from your users. But their impact and participation don't end there. The System Feedback Manager, gives you an overview of all the ideas, feedback, and suggestions that you've received. Create a LibAnswers ticket out of the idea. Post the idea to your Systems Dashboard so patrons can vote and add comments!